ISIS is at the gates of Baghdad. The war will careen out of control. The Shiites and the Sunni's will kill eachother off as Ron Paul predicted and it will keep ISIS from targeting Israel and the start of World War III. NATO will not risk World War III for the sake of Ukraine, Estonia, or Latvia. "Ah, yes ... keep the military industrial complex well oiled by more aggressor war-hawk scare tactics - keep those favored few who profit from arms manufacturing and skirmish wars, farting through silk, at the overwhelming expense of the general public; and while the country's infrastructure crumbles away." "According to the teachings of the true sutra, when the latter age has begun and Buddhism has fallen into complete disorder, a great sage will appear in the world. For example, the pine tree, which withstands the frost, is called the king of trees, and the chrysanthemum, which continues to bloom after other plants have withered, is known as a sacred plant. When the world is at peace, worthies are hard to distinguish. It is when the age is in turmoil that both sages and fools come into view. How pitiful that Hei no Saemon and the lord of Sagami failed to heed me! If they had, they would surely not have beheaded the envoys from the Mongol empire who arrived a few years ago. No doubt they regret it now. The great ruler Emperor Antoku, the eighty-first sovereign, commissioned several hundred teachers of the True Word school, including the Tendai chief priest, Myoun, to offer prayers in an attempt to subdue the General of the Right Minamoto no Yoritomo. But their curses “rebounded upon the originator,” as the sutra says. Myoun was beheaded by Yoshinaka, and Emperor Antoku drowned in the western sea. The eighty-second, eighty-third, and eighty-fourth sovereigns, that is, the Retired Emperor of Oki, the Retired Emperor of Awa, and the Retired Emperor of Sado, as well as the reigning emperor— these four rulers had the Tendai chief priest and Administrator of Priests Jien, and forty or more other eminent priests, including those of Omuro and Mii-dera temples, offer prayers to subdue the Taira general Yoshitoki. But again, the curses “rebounded upon the originator,” and the above-mentioned four rulers were banished to various islands. Concerning this great evil teaching [of the True Word school]: The three great teachers — Kobo, Jikaku, and Chisho — violated Shakyamuni Buddha’s golden words that the Lotus Sutra is supreme, interpreting them to mean that the Lotus Sutra ranks second or third and the Mahavairochana Sutra ranks highest. Because the rulers put their trust in these distorted views, they destroyed both the nation and themselves in this life and are destined to fall into the hell of incessant suffering in the next. This next special prayer ritual will be the third. Those among my disciples who have already passed away are probably now observing this with their Buddha eye. And those whose lives have been prolonged, watch with your own eyes! The ruler and other high-ranking officials will be captured and carried off to a foreign land, and those who conducted the prayer ritual will either die insane, or end up in a foreign land, or hide themselves in the mountains and forests. The messenger of Shakyamuni Buddha, the lord of teachings, has twice been paraded through the streets, and his disciples and other supporters have been thrown into prison, killed, injured, or driven from the provinces where they lived. Therefore, the guilt of those offenses will unfailingly extend to each one of the inhabitants of those provinces. Also, people will be afflicted with white leprosy, black leprosy, or all kinds of other terribly grave illnesses. My disciples, understand the reasons for this." 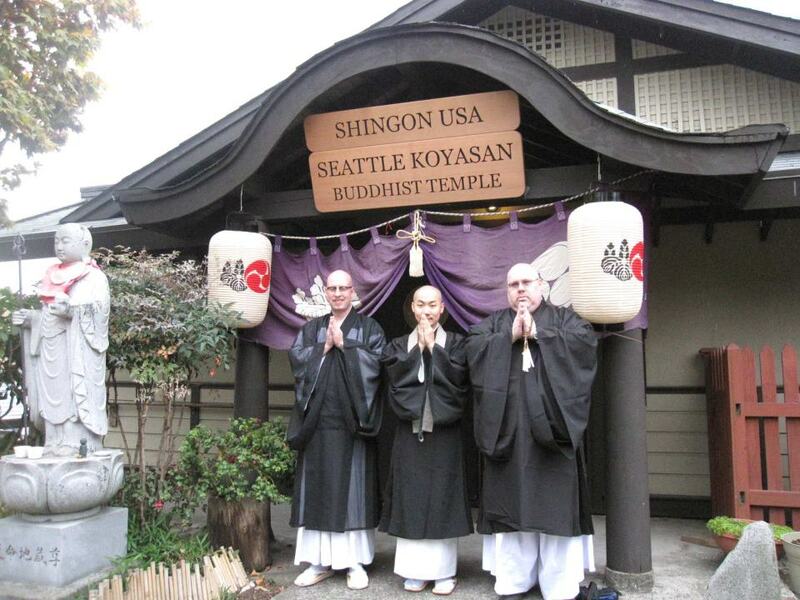 Were we to enter into discussions with this Shingon priest, he would neither be smiling nor posing for a picture. He would have been praying to Mahavairochana to punish us, the modern day messengers of Shakyamuni Buddha. His curses would have "rebounded to the originator" and he would have fallen into hell alive. Question: Why do you call Daisaku Ikeda, the president and eternal mentor of the Soka Gakkai and his top senior leaders greedy pigs? "Nevertheless, the schools of Buddhism other than Tendai have gone astray concerning the true object of devotion. The Dharma Analysis Treasury, Establishment of Truth, and Precepts schools take as their object of devotion the Shakyamuni Buddha who eliminated illusions and attained the way by practicing thirty-four kinds of spiritual purification. This is comparable to a situation in which the heir apparent of the supreme ruler of a state mistakenly believes himself to be the son of a commoner. The four schools of Flower Garland, True Word, Three Treatises, and Dharma Characteristics are all Mahayana schools of Buddhism. Among them the Dharma Characteristicsand Three Treatises schools honor a Buddha who is comparable to the Buddha of the superior manifested body. This is like the heir of the supreme ruler supposing that his father was a member of the warrior class. The Flower Garland and True Word schools look down upon Shakyamuni Buddha and declare the Buddha Vairochana and the Buddha Mahavairochana to be their respective objects of devotion. This is like the heir looking down upon his own father, the supreme ruler, and paying honor to one who is of obscure origin simply because that person pretends to be the sovereign who abides by the principles of righteousness. The Pure Land school considers itself to be most closely related to the Buddha Amida, who is an emanation of Shakyamuni, and abandons Shakyamuni himself who is the lord of teachings. The Zen school behaves like a person of low birth who makes much of his small achievements and despises his father and mother. Thus the Zen school looks down upon both the Buddha and the sutras. All of these schools are misled concerning the true object of devotion. They are like the people who lived in the age before the Three Sovereigns of ancient China and did not know who their own fathers were. In that respect, the people of that time were no different from birds and beasts." The pig is an appropriate animal to liken such men. Daisaku Ikeda and his leaders, like pigs, devour their physically, spiritually, or psychologically, wounded members, including their skin and bones. Their spiritual corruption through profligate wealth and power too, is not unlike a tame pig who is released into the wild and which becomes a viscious and dangerous feral pig, growing tusks and attacking both man and beast. Pigs, though naturally clean animals, have the karma to live and thrive in filth and they will eat almost anything. SGI's interfaith is not unlike the pig's indiscriminate eating of filth. The SGI has thrived through their associations with filth: An example is SGI's association with the Mitsubitchi corporation which builds and manufactures weapons of mass destruction. Pigs will literally eat themselves to death if given unrestricted access to food. The SGI mentor and senior leaders have given themselves unrestricted access to money and power through SGI's "planned giving", their hard sell contribution campaigns, and inserting their most loyal members into all facets of the Japanese government through stealth and the New Komeito political party. This, along with their lack of financial transparency, reveal the true nature of the mentor and the Soka Gakkai, that of greedy pigs. (1) If Nikko had been give the approval by the Great Saint with so much as these “Two Successions”, he would have naturally performed the office of Chief Officiant at the time of Nichiren Shonin’s funeral. However, in reality the forward echelon had Nichiro and the rear echelon Nissho; Nikko was on the left side of the rear echelon. (2) If the “Two Successions” were true, there would have been no necessity for choosing the Six Senior Monks and so on and if he had chosen them he would have made Nikko first. The Six Senior Monks were said to be not in order but they are listed in order of having become the disciples. (3) In “Two Successions” it says, “if the Ruler of the Country establishes this Dharma (Truth), erect at Mount Fuji the Precept Platform of the Temple of the Original Doctrine (Hommonji no Kaidan). Next, let us try to consider the division of Nichiren’s mementoes. In contrast to Nissho, who received “the Annotated Hokekyo” and Nichiro who received an “Object of Worship: one Standing Statue of Shakya”, Nikko received only “a Horse (one); saddle; tabi; hat; kosode” and so on. “in place of the Buddha which Daikoku Acharya seized away….” To write that the distribution of mementoes was “seizing” is not reasonable. In the current Taisekiji Branch of the Lineage of Nikko’s Disciples (Nichiren Shoshu and the Sokagakkai) they assert that Shakya is a “husk Buddha” and Nichiren is the Original Buddha, “Shakya is like a husk of a cicada and it is Nichiren who is the Original (True) Buddha”. The origin of that assertion is from a reaction to the fact that in the distribution of mementoes the image of the Master of Teachings Lord Shakya which Nichiren Shonin kept all his life went to Nichiro’s Lineage. Both documents appear for the first time in the “Kyakugojikkajo”, written by Nikkyo (1428-1489) in 1480. The contents of the two documents in this mentioning are different from what are preserved at Taisekiji Temple today. This is proof that several forgeries had already been made by the time of Nikkyo. Nichido (1283-1341), the fourth Chief Priest of Taisekiji Temple, clearly states in his “Nikkyo Shonin Goden Soan (The Biography of Nikko) that Nikkyo stayed at Minobu for three years, not six as falsely reported. Minobu Sojo bears the statement that the Hommon no Kaidon should be established at Fujisan Hommonji. Fujisan Hommonji is another name for Nishiyama Hommonji, which was founded by Nichidai (1294-1394), who had been ousted from Kitayama Hommonji due to a succession dispute. It appears the Monbu Sojo may have been forged by a chief priest of Nishiyama Hommonji. At one time, Nishiyama Hommonji was on friendly terms with Taisekiji. Therefore, Taisekiji had no objection to keeping the document although the place of the Kaidan was assigned to Nishiyama Hommonji, and not to Taisekiji. The two temples became hostile to each other after Taisekiji produced the Ita Honzon. Incidentally, the dictionary published by Nichiren Shoshu omits the statement about Fujisan Hommonji in the Minobu Sj that the Hommon no Kaidan should be established at Fujisan Hommonji. "... Are we moving away from not considering the Dai-Gohonzon special because the priesthood is holding it for themselves, and we don't have access to it or because it was never special in the first place?..." It was never special in the first place. Because NSA supported the Nichiren Shoshu Priests and never questioned their doctrines publicly. Actually , the sincere efforts of NSA members to construct the High Sanctuary were not and never will have been in vain. It represents the true acceptance of the Daishonin's vow for worldwide propagation. The priest's self-serving inventions are secondary. "For every item sold in the SGI World Peace Mall, $1.00 of the proceeds, goes to support the Soka Gakkai International's peace movement. The lion's share goes towards enriching the top Japanese Senior Leaders, building and franchising 7/11 stores, and buying up Mitsubichi Heavy Industrial preferred shares for the sake of SGI's stock portfolio. SGI-USA works diligently towards total global nuclear disarmament while supporting Mitsubishi's development of new missile delivery systems." Such a blatant lie from the SGI Texas Area Chief! "The purpose of our Buddhist lay organization is outlined in the Lotus Sutra where it states that the wish of a Buddha is to open the door to the Buddha wisdom, to show the Buddha wisdom to all living beings, to cause living beings to awaken the Buddha wisdom, and to induce living beings to enter the path of Buddha wisdom. In following this wish, we try to help people awaken that wisdom within themselves so they can make the best choices in their lives. The choices we must all make in life are individual choices, just as we are all individual people. Nowhere in the Buddhist canon is an instruction to advise people what to think, much less how to vote. Directly addressing today's question, in 1971 our lay organization passed a resolution agreeing that as an organization we would not endorse political candidates. Within our organization there are people supporting different political parties, candidates, and political thought. We are encouraged to participate actively in our society, and employing wisdom in voting for the leaders of our society is part of that. While in our meetings we don't discuss politics, individually we often engage in such discussions. I would not join other religious leaders in coalescing behind a candidate. I feel a religious leader should lead people to use their own religious understanding in the choices they make." "...but we are deserving and worthy of appreciating each word, paragraph, and phrase written by Daisaku Ikeda." "Nowadays there are few people who are guilty of the five cardinal sins, but a great many who commit the ten evil acts. Sometimes you may find a person who, concerned about his next existence, is careful not to commit any of the ten evil acts and to act as a good person. But because of some quite natural error of ignorance, the person, though good in word and deed, in his heart believes in an evil teacher. Not only does that person himself put faith in the erroneous doctrines expounded by such a teacher, but he incites the rulers of the nation and the common people to embrace these same doctrines, or he persuades his wife and children, his followers, and members of his household to carry out the same religious practices that he does. Thus he prevents them from forming any ties with persons who would instruct them in the correct teaching, and keeps the common people and those related to him from experiencing a mind that responds with joy to that teaching. As a result, both he himself and others become slanderers of the Law, and those who would appear to be practicing good and putting aside evil in fact quite naturally end by committing deeds that lead to rebirth in the Avīchi hell. Cases of this kind are rife in this Latter Day of the Law." How many wars and genocides in the name of God, gods, ideology, or country will we tolerate before embracing the Lotus Sutra? "Life is the foremost of all treasures. It is expounded that even the treasures of the entire major world system cannot equal the value of one’s body and life. Even the treasures that fill the major world system are no substitute for life." How much more so those who practice as the Lotus Sutra teaches? Will Daisaku Ikeda and his top leaders fall into hell? That depends on whether or not they recant their mistaken views. So far, I have not heard anything from them that leads me to believe that they had. Therefore, it is certain that they will fall into hell. "My wish is that my disciples will be cubs of the lion king, never to be laughed at by the pack of foxes. It is hard to encounter a master like Nichiren, who since distant kalpas in the past down to the present day has never begrudged his body or life in order to expose the faults of his powerful enemies!" "When I was in the province of Sado, I lived in a graveyard called Tsukahara, at a place between the meadows and the mountains that was far removed from human habitation. I lived in a small hut built with four posts. The roof boards did not shut out the sky, and the walls were crumbling. Rain came in as though there were no roof at all, and the snow piled up inside. There was no image of the Buddha, and no trace of matting or other floor covering. But I set up the figure of Shakyamuni, the lord of teachings, that I have carried with me from times past, and held the Lotus Sutra in my hand, and with a straw coat around me and a straw hat on my head, I managed to live there. Four years passed, during which no one came to visit and no one brought me food. I was like Su Wu, held captive for nineteen years in the land of the northern barbarians, wearing a straw coat and eating snow." "But other rulers such as Kings Mihirakula and Udayana in India, Emperors Wu-tsung and Ch’in-tsung in China, and Emperors Kimmei and Yōmei in Japan paid honor to evil spirits or non-Buddhist teachings, were followers of the Taoist priests, or worshipers of the gods. For that reason, they were implacable enemies of Shakyamuni Buddha and brought destruction upon themselves and disquiet to the world. During their reigns Buddhist sage priests encountered great difficulties. Japan has by now become a country in which slanders of the correct teaching are taking place to a large degree, and it would appear that it is ripe for invasion by foreign lands. If one is aware of this fact but fails to speak out about it, then although one may enjoy peace and security in one’s present existence, one will surely fall into the great citadel of the hell of incessant suffering in the existence to come. On the other hand, if, out of fear of that fate, one does speak out, one must be prepared to suffer exile or the death penalty." "They will not be destroyed by evil persons, non-Buddhist teachers, the heavenly devil Pāpīyas, or wielders of the five transcendental powers. Rather it will be those who appear to be Buddhas or who appear to be arhats who possess the six transcendental powers, monks who observe the precepts, wrapping their bodies in the three robes permitted by monastic discipline and holding a begging bowl reverently before their eyes, high-ranking monks whose renown is like a great wind sweeping over the grass and trees—these it will be who will destroy the correct teaching of the Buddha. When that time comes, the Buddha predicted, Brahmā, Shakra, thegods of the sun and moon, and the four heavenly kings, angered by these events, will cause great changes in the heavens and portents on the earth to occur as a warning. And if these warnings are not heeded, they will see that the seven disasters break out within the nation. Parents, siblings, ruler and subject, and the mass of common people will attack one another with great fury and, as if they were the owl that eats its own mother or the hakei beast that kills its own father, they will bring ruin upon their own nation, and in the end it will be attacked by enemy states from abroad. Now I, Nichiren, use the sacred teachings of the Buddha’s lifetime as a bright mirror in which to observe the situation in this country of Japan. And this mirror reveals that without a doubt there are persons here who are enemies of the nation and enemies of the Buddha. Among the sacred teachings of the Buddha’s lifetime, the Lotus Sutra is not only a bright mirror but a divine mirror. A bronze mirror will reflect the form of a person but it will not reflect that person’s mind. The Lotus Sutra, however, reveals not only the person’s form but that person’s mind as well. And it reveals not only the mind; it reflects, without the least concealment, that person’s past actions and future as well. The meaning of this passage is that a person who presumes to expound even one word or phrase of the Lotus Sutra must have a very clear understanding of the relative profundity of the various sacred teachings of the Buddha’s lifetime and of their proper sequence. The case is comparable to a calendar for a year with its 360 days: if there is a mistake in the numbering of even one day, then all the other days in the calendar will be thrown off. Or it is like the thirty-one syllables that make up a poem: if even one word or syllable is wrong or out of place, then the thirty-one syllables will not combine to form a poem. And in the same way, though one may read and recite only one sutra, if one is confused or mistaken regarding the sequence in which the sutras were preached, beginning with that expounded at the Buddha’s place of enlightenment and ending with that preached at the very end when he lay between the sal trees, or if one does not understand their relative profundity, then, though guilty of none of the five cardinal sins, one will fall into the hell of incessant suffering, and the lay believers who rely upon such a person’s guidance will likewise fall into the great citadel of the Avīchi hell. How much worse is the situation, then, when a wise man appears on the scene who fully understands the relative merit and profundity of the various sacred teachings of the Buddha’s lifetime. At that time certain priests, handing on confused and mistaken doctrines inherited from the founders of their respective schools, become national teachers or teachers to important families and, distressed at the thought that their own shortcomings may be brought to light or that they may be despised by others, they proceed to slander the above-mentioned wise man to the ruler of the nation, or tempt others to speak ill of him. When that happens, the heavenly deities who guard and protect the nation will rain down destruction upon it like a fierce wind tearing the leaves of the flimsy plantain or great waves overturning a small boat."